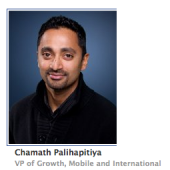 Facebook VP Chamath Palihapitiya, who leads the company’s growth, mobile and international efforts, will leave to start a venture capital firm. Palihapitiya has been with Facebook since 2007 and was the first executive in charge of Facebook Platform, which he says will underlie many of his investments, though they will be in diverse sectors including technology, healthcare, education and financial services, according to TechCrunch. Prior to joining Facebook, Palihapitiya was briefly a venture capitalist at Mayfield Fund. Before that he was at AOL. He has been an active investor throughout his time at Facebook in companies such as Playdom (bought by Disney) and Top Prospect. Facebook, which is expected to go public in the next year, has earned a reputation for leaking top executives and long-time employees. Palihapitiya’s resignation follows that of VP of Technical Operations Jonathan Heiliger, who announced last month he plans to leave the company at the end of the summer. Facebook only acknowledges 13 people on its executive bio page; now two of them will be gone. That said, both of them are leaving on high notes; Heilinger just opened Facebook’s data center and open-sourced its design, while Palihapitiya has reigned over a period of almost unfathomable growth.